What Does Sailing For Blondes Mean to You? Sailing means controlled riding of the wind across the water. For means men, women and even brainiacs who want premium instruction at a modest price. Blondes means it is a tribute to all of the intelligent, successful, handsome, beautiful and accomplished blondes of the world! We partner with you, the student, the student partners with us, the educator, and the patent pending simulator ties us together in full understanding of the conceptual reasons of why a boat sails. 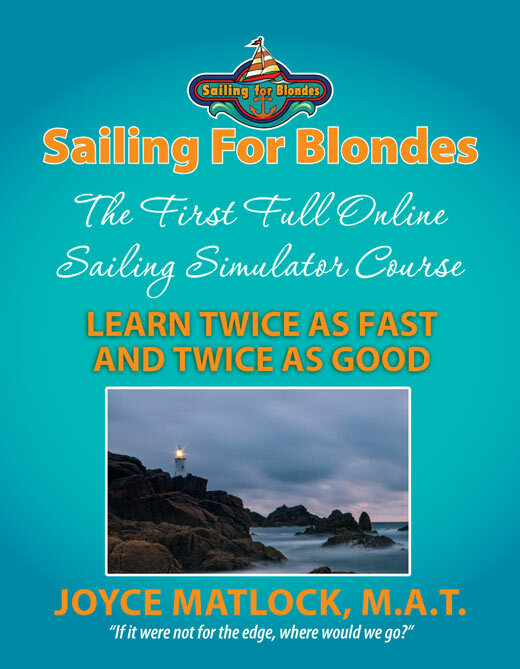 Sailing For Blondes has uniquely redefined points-of-sail instruction using the simulator to suit the way your brain thinks. It is easily understood with use of The Simulator that speeds learning twice as fast and twice as good! 🙂 We offer both books for self-study and the first, complete Online Sailing Simulator Course on exactly how to sail a boat. Sailing For Blondes teaches beginning sailors and sailors wanting to brush up on their skills to understand how to sail. We serve the adventurers who love freedom and Mother Ocean and want sailing to be an extraordinary experience in their lives. 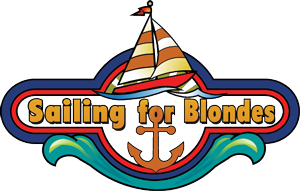 You are a good fit for us if you expect a positive outcome from Sailing For Blondes and you enjoy accomplishment. You are ideal for our book and/or course if you would like to sail recreationally with friends and enhance your social reach with like-minded people. You may be planning to take an on-the-water course and want to be ahead of the curve conceptually and therefore get your money’s worth. 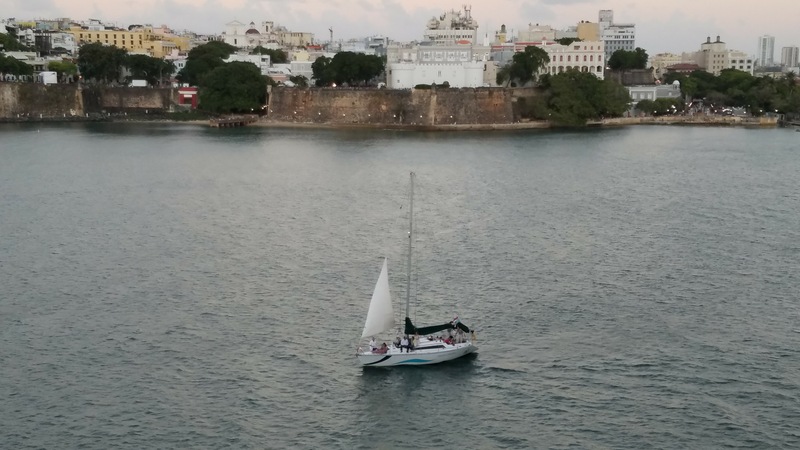 You may be someone who sails or cruises with a partner and wants to learn to be great crew and can sail the boat even if you are not the captain. Also, you may be planning to do a sailing charter and want to be better prepared. You may be starting to race and want to have a better understanding of the points-of-sail so you will be competent crew. Or, you may be an instructor wanting an easier way to teach the points-of-sail to your students. Then again, you may be at that point in sailing where it is confusing and you want to better understand how and why a boat sails. You may feel intimidated about taking a class and not keeping up with everyone there since they may have more experience and understanding. 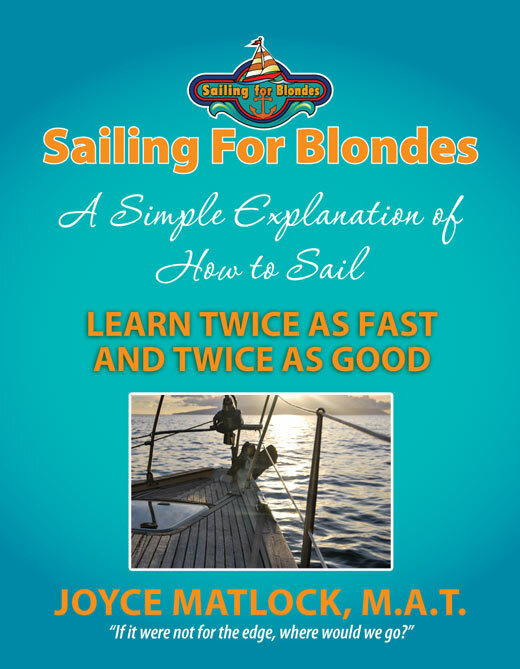 In Sailing For Blondes, you have found an interesting and entertaining, step-by-step solution. Whatever your reasons, you are a good fit for us if you are motivated to learn to sail and are willing to roll up your sleeves and work at studying material that will give you an outcome of full understanding of how and why a boat sails. Then, you can take that knowledge to the water and practice. The result will be a sailing learning curve that is not boring, is twice as fast and twice as good, and a sailing course that will save you time and won’t break your pocketbook. The simulator is the centerpiece of the training and sets us apart from all other training. Under the leadership and mentorship of Joyce Matlock, we provide the first full online sailing simulator course. 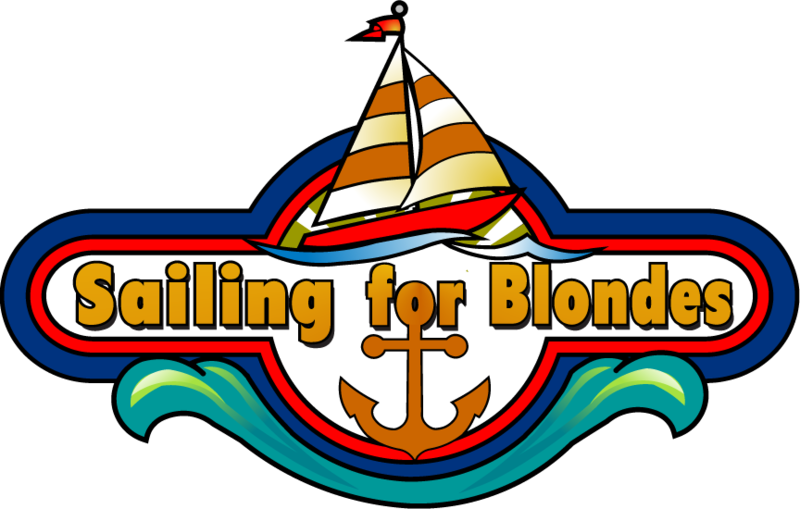 Sailing For Blondes is a name-brand course that focuses on conceptual understanding of how to sail a boat. It’s an easy-to-comprehend learning experience and using the simulator makes it a no-brainer! The hands-on sailing simulator that is used throughout the training cuts through your confusion. Beginners will learn the basics of finding the wind, choosing where they want to go, and setting the sails to get there. Sailing enthusiasts from varying skill levels wanting to improve and develop their skills will find this course and simulator delivering understanding that can easily be shared with others. Once conceptual understanding is in place, practice on the water becomes decidedly more beneficial in the time allotted to it. It makes learning twice as fast and twice as good. 🙂 And Finally, it is Patent-Pending! 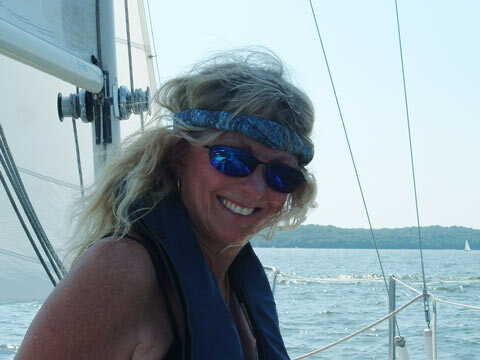 Joyce Matlock is the author and creator of the most unique teaching method you can find on sailing instruction that includes a simple to understand hands-on sailing simulator. 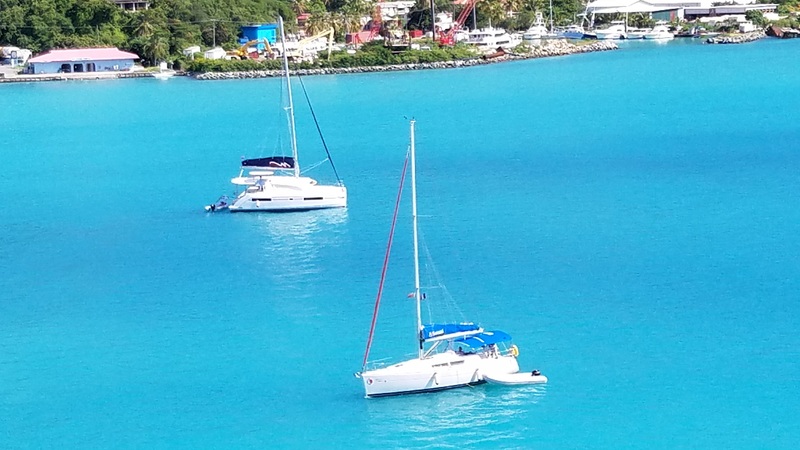 She lived aboard her Valiant 40’ for four years, ran charters in the Virgin Islands with her husband, cruised extensively, is a US Power Squadron graduate, a volunteer sailing instructor for Percy Priest Yacht Club where she serves on The Sailing Education Team. She has a Master’s in Teaching from Trevecca University. The book is a start-to-finish education during a typical full day of sailing. It is the only sailing instruction book that teaches the technical information tied in to a storyline and a learning dialogue that fully explains step-by-step instructions.The story is about a man serendipitously meeting a female captain and her dog and learning to sail with her instruction. The crew on board will teach you and entertain you with their authentic love for sailing, life, others and each other. It is a real-to-life learning experience that will teach you while drawing you into the magic feelings of learning to sail and sharing it with one that you love. When I first began sailing, I loved it but didn’t understand it. It was very painful and frustrating to me to love the entire experience of sailing and yet be unable to understand how to do it. I began reading books, I began trying harder, I began thinking and wondering why I was having so much trouble with what my partner did so effortlessly. He was teaching me by telling me to watch the telltales and I did not understand at all. I can remember trying so hard to remember what the telltales were telling me depending on whether it was the green telltale or the red telltale. I did not understand that I could make a choice of whether to trim the sail or change my course to get the telltales to fly correctly. So, in frustration and some intimidation, I became good crew in that I could hold a compass course, but really couldn’t make decisions on how to set the sails or whether I needed to tack or jibe. I was confused. When we decided to end our marriage, I bought my own boat and was forced to either motor or learn to sail better. At first, all I did was motor and I was shy about putting the sails up especially if the wind was blowing. Funny, now that I look back on it. So, I kept reading sailing books and my learning curve on my own was long and steep. I finally had an adventurous friend, who although knew nothing about sailing, was willing to put the sails up with me. I had no one to teach me and evidently didn’t think of taking a course. I continued to practice with one sail on my own until I somewhat figured out the points-of-sail by visualizing slices of a pizza. Wow, now that’s amazing, isn’t it. But, that was my aha moment! I was excited about my realization of what had been my enigma for such a long time and I wanted to tell others about it in a way they could understand. That knowledge was transferred to a clock and I put together a rudimentary sailing board. I began explaining my board to others and became very excited when they began to quickly understand what I was showing them. That beginning simulator is now developed and is the centerpiece of the entire Sailing For Blondes Method. That was 15 years ago, but life goes on and I was working, got my master’s, and was sometimes working on my sailing project and sometimes had it on the back burner. As part of the project, I began writing a book and worked on it one entire summer during my break from teaching. Still, I didn’t finish. And, as I just have to say it once again … after years the simulator is patent-pending! Today, I am working for myself, and am dedicated to my project; the students, the book, the simulator, the method of teaching, and my online course. I am doing what I love to do and that’s sailing, teaching and helping others. 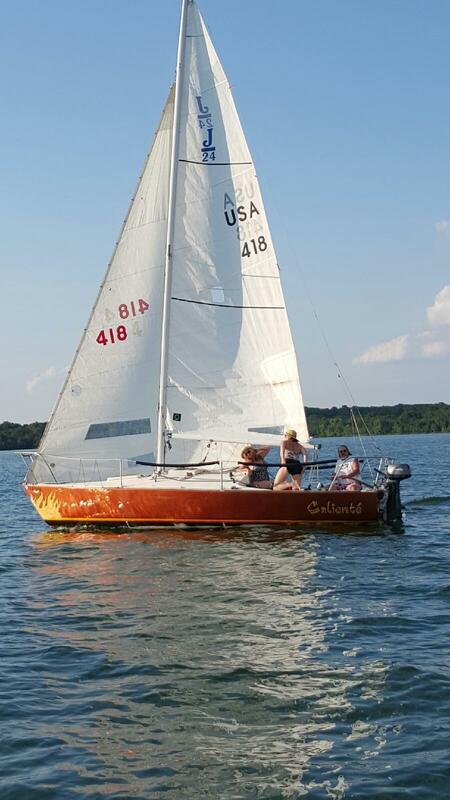 I teach as a volunteer on-the-water instructor for Percy Priest Yacht Club in their Learning at the Helm program and I teach online with my Sailing For Blondes program. I also have taught the U.S. Sailing curriculum for my sailing club and also teach a focused points-of-sail course. I know that my simulator will teach you sailing concepts in a way that you will understand, comprehend well, and then be able to take your knowledge to practice on the water. Whether you are learning with friends, a partner, or taking a sailing course, you will find incredible benefit from my book, my simulator and my online course. As stated in my book title, you will learn twice as fast and twice as good. 🙂 It will save you time, give you a full conceptual understanding and it won’t break your pocketbook. I love sailing now and I have always loved it. The difference is that now I have decided to share this simulator along with my book and online course with the world. If you love to sail and long to understand how to sail, please read my book, use my simulator, and take my online course. I know your outcome will be clearing your mind of the confusion and intimidation you have experienced in learning how to sail. Community is important to us and we believe that our community is dependent on our values. We believe in giving you more than you expect and doing it with honesty and integrity. We believe in our simulator product and training or we would not offer it to you. We want you to be successful in your training. We give you a premium course at a modest price. We guarantee if you do the work in the course and are not completely happy, just let us know and we will refund your money. We love what we do and will give you all that we have. We are student oriented and committed to your having a positive outcome. What that means is we give you precise points-of-sail training that provides you the foundation to advance in your sailing ability more quickly and easily than if you go straight to an on-the-water course. Or, you will learn much faster whether you are learning alone or learning with friends. We will give you good quality at a good price and give you service before, during and after signing on. We are a new, small company striving to be an educational leader and we are committed to doing that in a personable, honest and innovative way. This book is both entertaining and informative. It is easy to understand for someone (male, female, blonde, brunette or redhead!) who has never sailed before. 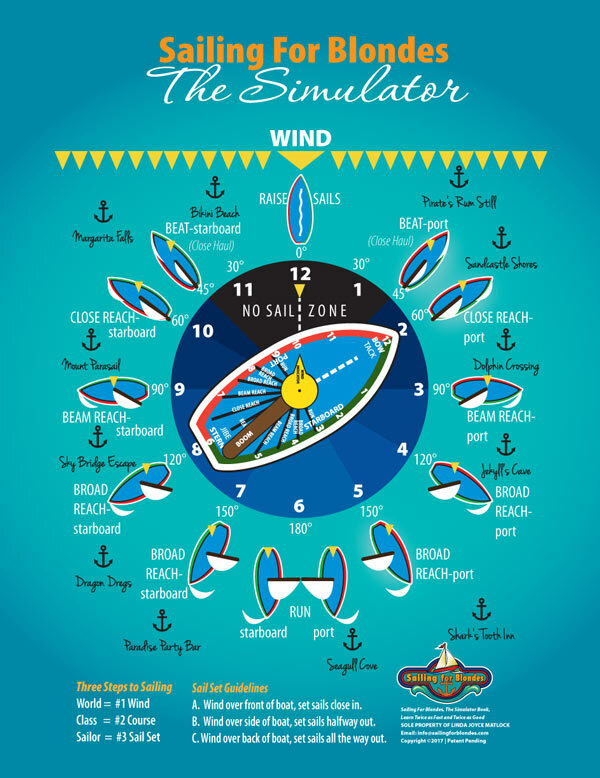 It explains basic concepts for anyone who has sailed before but was confused by the complicated concepts and terminology. The simulator gave me the understanding of how to sail that I did not have prior to using it. After years of wanting to sail, I came out to PPYC in Nashville to a Learning at the Helm event held on Tuesday evenings. Joyce approached me, looked me in the eye and asked "Would you like to learn how to sail?" Of course I said yes and she started to explain the sailing concepts and points of sail in a way that made total sense to me. An hour later we were out on her boat and actually sailing! As we tacked and jibed, it all came together and I couldn't believe how much I gained in such a short time. I have taken that knowledge and used it as my foundation to build on in sailing courses and just sailing out on the water ever since. Joyce helped unlock the mystery of sailing and is a huge part of the passion for sailing I have today.